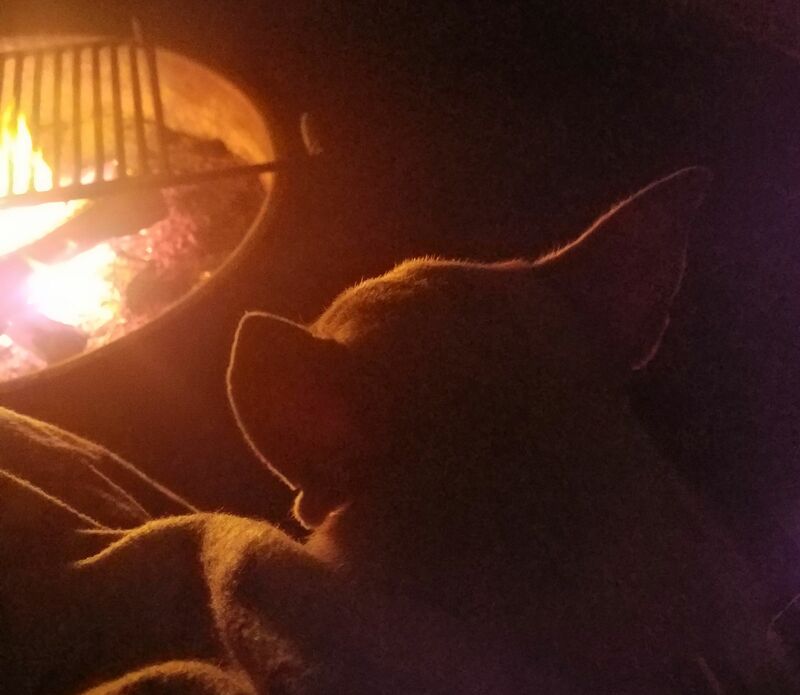 When I awoke this morning before dawn, our sweet little Peanut was stretched out fully between us in the bed – her forehead nuzzled into my chest, and her tail held tightly against her hindquarters pressing against the small of Sue’s back. Peanut was already awake, as she has been throughout most nights of late, and I could hear the rumble of the fluid in her nose, throat, and lungs as she struggled with each shallow breath to get enough air to continue living. Remembering my own childhood terror when I was unable to breathe deeply enough, and thought I must surely die, I pressed my lips to Peanut’s ear whispering over and over as I have so often in the last couple of months, “It’s all right, Doggie. Don’t be afraid.” We snuggled a while together there with the first meager light of the new day touching the edges of the bedroom window shades, and I considered what would soon be taking place. Today was the day we had chosen for Peanut’s last trip to see the vet. The appointment was set for 10 AM – just a few hours away. It would be a long day, a hard day. How I wished that we could just go back to sleep and keep the day from coming so soon. As we all lay there, dreading the coming day, it occurred to me that Peanut lying stretched between us was symbolic of the service she had given our family. When Peanut first came to us, Sue and I were literally a world apart. I was away at the war in Iraq, having left Sue and our sons behind in the home I had never truly shared with them. In point of fact, it had been over five years since we had all shared a home together, and if the truth be told, we were mostly content to have it that way. I hadn’t been a very good husband to my wife nor father to my sons. They were as happy for me to be away at war as I was to be there. Peanut was able to give Sue the unconditional affection and devotion she craves from me, and to be the object of the affection and devotion Sue longs to give. Over the course of the next twelve years, God used Peanut to build a bridge between us, and begin healing our marriage, just as Peanut’s body was stretched between ours this morning. All too soon I knew, Peanut would no longer be able to give us that bridge to reach across. From now on it will be up to us to close the gaps between us ourselves. What she did wordlessly, we must now somehow do with our voices. It’s a daunting prospect, but a worthy challenge. Peanut’s health had been in steady decline since she was bitten by a snake about five years ago. Although she survived the poison, it destroyed her thyroid, and she had been on synthetic thyroid ever since. Over the next year or so, she lost almost all of her hair. What hair she still had was course and brittle rather than smooth and soft as it had been before the bite. Her skin turned crimson, then black, and became stiff where it had always been supple and tender before. She also became insatiably thirsty, and drank so much that she was eventually unable to control her bladder through the night, and had to start wearing a diaper to bed. We thought she might be diabetic, but the culprit turned out to be Cushing’s disease – an over abundance of cortisol caused by a tumor on her pituitary gland which disrupted the ordinary communication between her pituitary and adrenal glands. The treatment was a form of chemo therapy designed to destroy some of the cells in her adrenal glands that produce cortisol. The treatment restored her skin, hair, and bladder control, and we thought she’d really turned the corner. But during her periodic cortisol test a few months ago, the vet detected a serious heart murmur. Her heart wasn’t pumping efficiently enough, and over the next few months she became increasingly short of breath, and unable to regulate her temperature. She started to have coughing bouts as the fluids built up around her lungs and heart. Throughout this time, I prayed continually for God to heal her heart, or barring that to allow her to die on her own without the pain and terror of multiple organ failure and inability to breathe. When it became apparent that neither of these was in God’s plan for Peanut, I began to pray simply for discernment of when to have the vet put her down. She seemed to still enjoy her life, and wasn’t in apparent distress, but Peanut had always accepted discomfort stoically, and it was impossible to tell whether she was suffering or not. We needed God’s help to make the call. She had good days and bad days. The good days filled us with the soaring hope for her recovery, but the bad days brought despair and guilt that we were selfishly allowing her to suffer. So we decided together ten days ago, that we would spend a few more days doing the things Peanut always enjoyed until her Cushing’s medication ran out. Then, if her condition didn’t radically worsen or improve, we would have her put down… today. After my return from Iraq, I was posted to Germany, and Sue and Peanut joined me there. Our lives together centered around long walks through the forested hills of the Pfalzerwald in southwestern Germany. We became avid Volksmarchers, and despite her small size, Peanut could easily handle a 20 Km walk on Saturday, and another on Sunday. A favorite game was to tell Peanut to “stay” just below a point on the trail with several switchbacks leading up a hillside, while we walked on up the trail. Then, when we thought we had pushed her obedience to the limit, one of us would yell, “Where’s that doggie?” She would then streak up the trail after us, sometimes bypassing the switchbacks, and run right past us for a hundred feet or so, and then come rocketing back past us over and over until she got too tired to continue, and fell into her place again walking beside us. All the while, God was using these walks in the woods with Peanut to heal our marriage too, after years of physical separation and spiritual isolation from each other. Often despite Sue’s objections, I allowed Peanut to roam free on these woodland walks, and she loved to sniff after the wildlife that roamed the woods around us. On one occasion, Sue wasn’t with us for some reason, so Peanut and I went out on our own. As I often did, I decided to blaze my own shortcut between two familiar trails, climbing through the underbrush up a steep hillside. When I got to the top, Peanut was nowhere to be found. I called and called for over an hour with darkness coming on, doubling back over my path many times. I had finally decided to give up, and head for home, knowing that Sue would not be able to forgive me for losing our Peanut. I could almost hear the tenuous threads of our barely restored relationship snapping from our grief over our beloved little friend. As I turned for home, I looked down, and there she sat waiting for me to lead her home. I snatched her up and squeezed her to my face as I sobbed uncontrollably. Peanut loved to go for a “walk outside” and knew the phrase. So when we were planning them, Sue and I would often refer to them phonetically as Whiskey Oscar (WO), so Peanut wouldn’t get too excited or be too disappointed in case the planned Whiskey Oscar didn’t pan out for one reason or another. Later on, when we were re-assigned to California, we began to refer to the beach as the “B word” for the same reason. Once we got to California, our walks together got longer and more rugged. 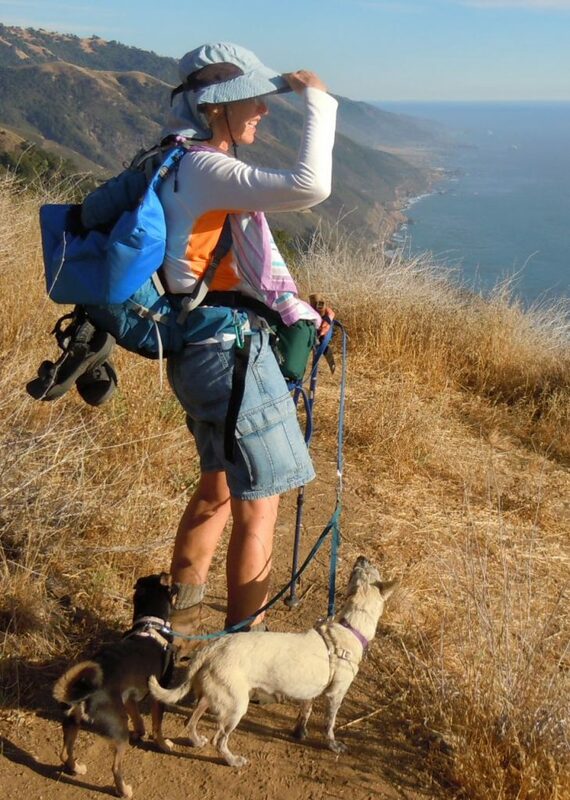 Peanut and her new companion Grace, made many hikes of 20 miles or more per day with us through the Pacific coast range of California’s central coast. But Peanut was getting older, and sometimes the trail was too long, the climb too steep, or the rocky footing too sharp or too hot for the doggies’ feet, so we got shoulder sling bags in which we could carry the dogs through the rugged terrain when needed. It was on one of these California outings that Peanut encountered the rattlesnake that cost her health so dearly. One late afternoon in the Ventana wilderness of Big Sur while I was once again, blazing my own path through unfamiliar territory, we got completely lost. We became separated from each other, and I feared I had lost not only Peanut, but Sue as well. Never have I prayed so desperately, and God was merciful to bring us all together again. With darkness closing in quickly, we were making our way down a steep slope when I lost my footing, slid down the slope several hundred feet, and plunged into the frigid creek at the bottom. Warning Sue to stay where she was, and not try to reach me, I managed to scramble my way back up to where she was waiting with the dogs. She had found a burnt-out Redwood in which we hunkered down for the night. I was soaking wet, and began to go into hypothermia. Sue, and the dogs kept me alive through the night until we could get our bearings and hike out the following morning. Peanut contracted a terrible case of poison oak rash that day. Dogs and other hairy animals are normally immune to the poison oak oil, but Peanut was susceptible due to the baldness caused by her as-yet-undiagnosed Cushing’s disease. It was also in California, that we introduced Peanut to the beach. Although we never allowed the dogs off leash during the Whiskey Oscars after Peanut’s rattlesnake bite, we still allowed them to run free at the beach. Peanut didn’t like to get wet, so she avoided the water unless we shamed her into dipping her feet by calling out “Where’s that doggie?” while we waded. 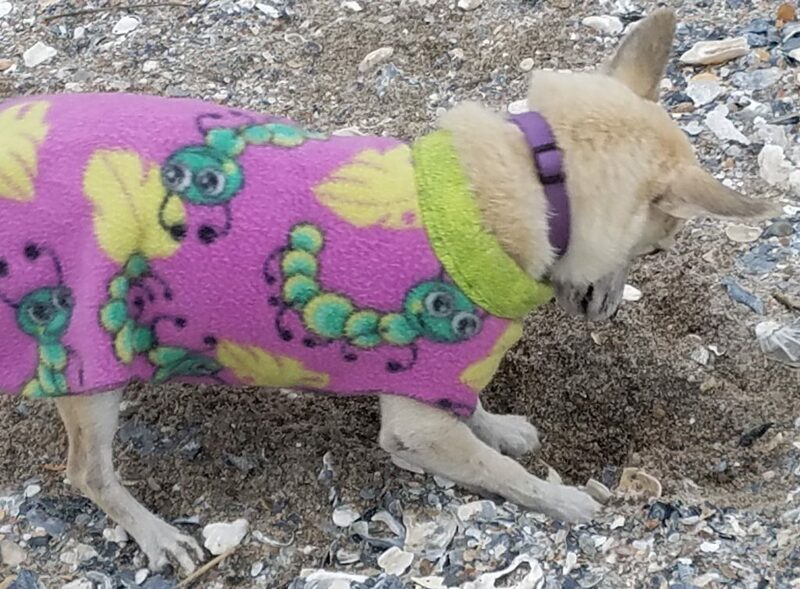 But she loved the warm sand, and running up and down the beach with Gracie, sniffing up the various items cast up on the shore, begging for treats from the strangers along the shore, and rolling in the rotting corpses of dead sea creatures unless we caught them before they could do it. 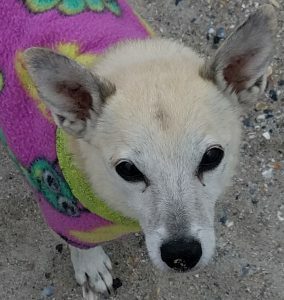 Once we left California, where the water is really cold, and came to the Atlantic coast of South Carolina, Peanut was more tolerant of the water, but she never really loved to swim, like some dogs do. I think she was wisely intimidated by the ocean, and kept well clear of the waves if given the choice. Despite her failing health, Peanut still loved to have a day at the B-word, or go for a Whiskey Oscar, so after her really bad day last week, when Sue and I finally decided we needed to have Peanut put down, we wanted her to get to do some of her favorite things during the last few days until her medications ran out. Even though it is January, we took her for one last romp on the beach last Sunday, then we went camping for a few days on one of the Savannah River lakes. Although we got to have one short Whiskey Oscar on Friday, we spent most of Saturday fishing – something that both dogs find frankly boring. Our intent had been to take one last long Whiskey Oscar yesterday on our way home from the campground, but unfortunately it was raining heavily all day. As I lay snuggling with Peanut today at dawn while Grace and Sue were snoozing, I was going over all these things in my heart. I indulged myself in yet another deep sob, and resolved to get Peanut out on one more last Whiskey Oscar before her appointment with the vet. As soon as Sue awoke, I asked her to see if she could get the appointment slipped to the afternoon. We went out to the woods for a couple of hours, and then straight to the vet. As the doctor pushed the sedative into Peanut’s vein, I whispered softly into her ear, “It’s all right, Doggie. Don’t be afraid.” Then I whispered it again along with “Thank you for healing our family,” as the second shot was injected, and then she was gone. Farewell, Peanut – sweet friend. Thank you for making our family whole again. Just beautiful. I don’t think it’s a coincidence that Dog is God spelled backwards.